In a global economy, multinational companies often operate in jurisdictions where governments are either unable or unwilling to uphold even the basic human rights of their citizens. The expectation that companies respect human rights in their own operations and in their business relationships is now a business reality that corporations need to respond to. With supporting case studies throughout, this text provides an overview of current themes in the field and guidance on practical implementation, demonstrating that a thorough understanding of the human rights challenges faced by business is now vital in any business context. 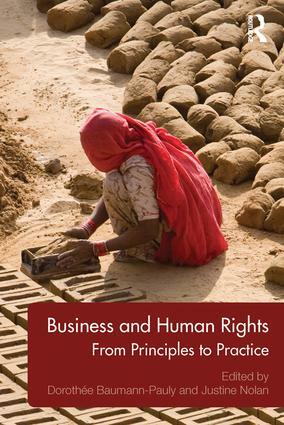 "An important contribution to a vital subject, this excellent primer on business and human rights offers valuable insight for both current and future practitioners. Recognizing the challenges and preparing effectively are vital to drive responsible and sustainable business." "Baumann-Pauly and Nolan have written an important and ambitious book, tackling a topic that remains increasingly urgent and still understudied: how to integrate human rights concerns into global business. The editors skillfully examine the complex history of this topic and sketch out a number of realistic strategies that stakeholders can use to bring human rights issues more forcefully into the corporate environment. The book will be a useful tool for educating both future and current business leaders." Debora Spar - President, Barnard College, Columbia University, New York, USA. Dorothée Baumann-Pauly is Research Director at the NYU Stern Center for Business and Human Rights, New York and an editor of the Business and Human Rights Journal. Justine Nolan is an Associate Professor in the Faculty of Law at the University of New South Wales and Deputy Director of the Australian Human Rights Centre. She is a Visiting Scholar at NYU Stern Center for Business and Human Rights and an editor of the Business and Human Rights Journal.